For the past few years, TL's buddies from work and their friends (this year about 200 of them) get together for a giant pub crawl. With a bunch of firefighters, you're always guaranteed an entertaining day. The crawl started at 8:00am... but don't worry, we aren't that crazy, we joined in at about 10:30am after getting settled in our Downtown Sacramento hotel room. I am not sure about the final number of bars we made it to - but we stayed about an hour at each place. Me and my sweet guy! There are small teams within the entire crawl group. One member from each team switches off being the "runner". The Runner goes to the bar at the first whistle (before everyone else) to buy the next round of drinks. That way, when the second whistle blows and everyone goes to the next place - the drinks are already waiting for them. Hope you had a wonderful St. Patty's Day!! How Fun!!! An all day crawl.....priceless!! Hope Mama Mia was great too!! Did you go to Streets of London downtown? I miss that place! I've only been to the one downtown once, but I use to go to the one in West Sac a few times a month! 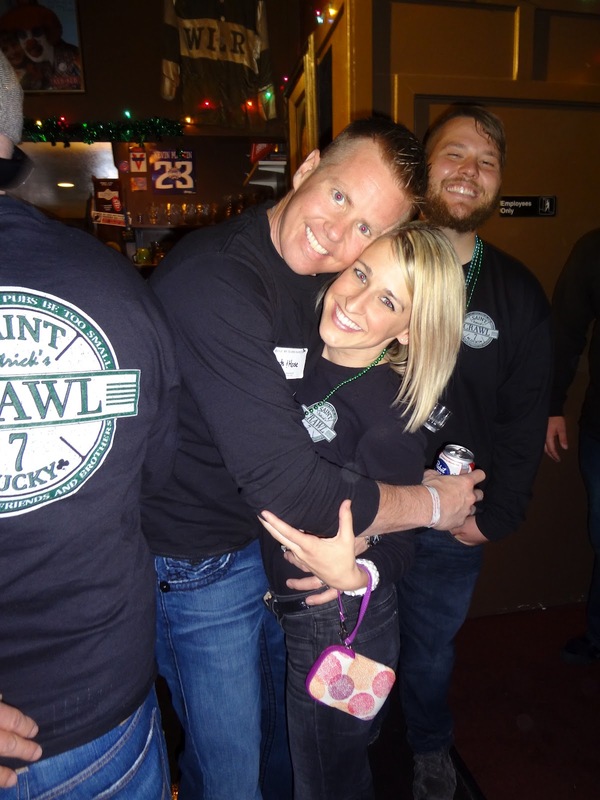 I've never done a pub crawl but I hear they're fun and it looks like y'all had a great time! Sounds like so much fun!! What a crazy time, but yet so organized - runner?! Genius! How fun! That sounds like a total blast! Wow, other people are even better organized drinkers than I am. Looks like a great time! So fun! We did a pub crawl too and it was my first time since college. We had a blast and it looks like you guys did too. ummm i'm joining next year!! that's is an awesome idea about the runners! so cool! Looks like a great time! I love that you wore black with green accents--much better than all green hehehe! How fun! I love that TL went up on stage. What great pictures you got! That seems like it was a lot of fun!!! This looks like such a blast! Such a great way to hangout with friends :) I did one in the Marina in SF, but we didn't get such legit shirts! That sounds like a lot of fun. 200 ppl! wow! What a fun time! You guys do such fun things! I want to move there and be part of your friend group! haha! :) And you look adorable, friend! The hair is fantastic! Now that sounds like some serious fun! Cute pics! Not sure why we have never joined in on the fun! Looks like a GTEAT time!! !